I just added an extra temp sensor to my VP2 and have been trying to add it's value in a couple places on my interface pages. I see the temp listed as Sensor 1 under the Extra sensors link. I have not succeeded. After reading many posts, I now wonder, is this even possible with a reasonable amount of effort? I'd rather not spend more time experimenting if it is not. I didn't figure out how to extract just the value of extra sensor 1 from that JSON. I did figure out a way to put the value under my temp guage on my gauges page. It's ugly behind the scenes but looks nearly the same when viewing my gauge page. I already have Apache running so I can have pop up graphs on my interface pages. 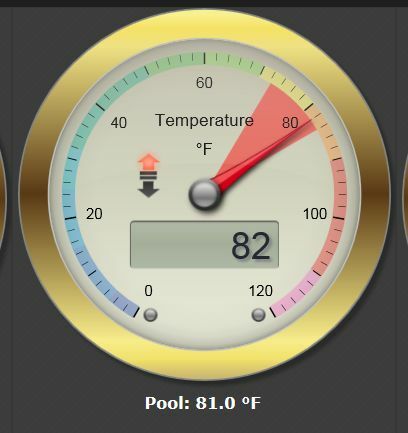 I made a htm with nothing but extra temp 1 on it and inserted it as an iframe under my temp gauges in my gauges page. This will have to do until/if I sort how to extract and use just the figure from the JSON. You can probably use jQuery instead of that second line, which would result in slightly simpler code, but the very nice Bordeaux blanc that I'm drinking is limiting my ability somewhat. I initially had no luck getting this to do anything and moved on to trying to truncate numbers in my iframe method. After figuring out how to truncate my numbers using said iframe method of getting extra temp 1 to display I came back to this to try to figure out how to do it "right". I immediately notice "Math.trunc" which was my big stumbling block with the iframe method. I changed that to "Math.floor" (Math.trunc doesn't work in the version of Internet Explorer I was using to test). Try as I might, I cannot figure out how to get the current JSON data into a string called "str" to use in place of this static data. If you or anyone else could give me a nudge in the right direction it will be greatly appreciated. Last edited by sfws on Wed 05 Sep 2018 6:45 pm, edited 1 time in total. Shouldn’t need to do that conversion, as it can be used in json format in this case. It’s simply the call to get the data using the URL that’s needed, and I just can’t remember how it’s done - probably uses ajax.